No notice, nothing…what do they think I am. The new fence will be look so much better. You have some lovely selfies this week. The new fence looks very nice. 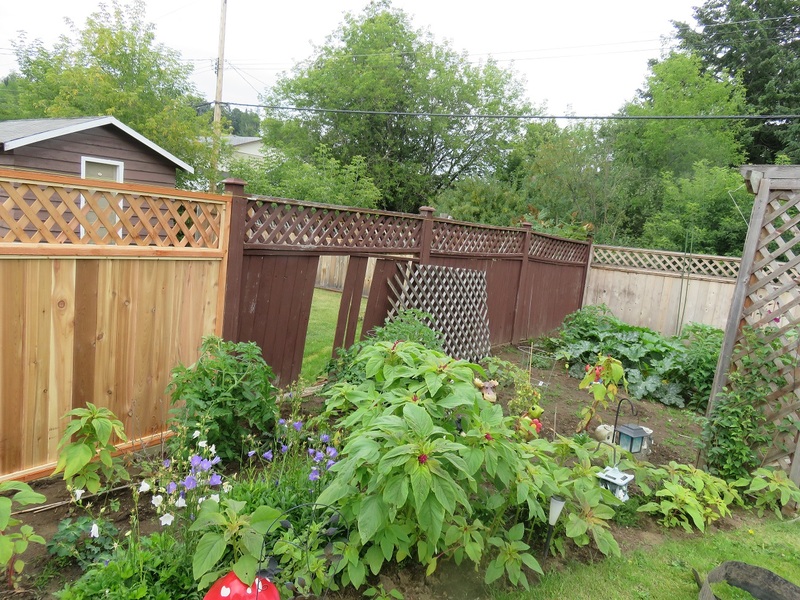 Doesn’t the fence look good, especially when the old one is partially up…..omne can compare them. The tiny bird is a hummingbird. We don’t hang a hummingbird feeder anymore because they can be messy and sticky beside that there are lots of kitties looking for prey over here. Funny, I have never shown no interest in hummers. Kali however would catch about 8 during the summer season. She never killed them though and they could be saved. It’s not always cold here. Usually our summer’s are quite warm…hot even. This year seems to be an odd weather year though. Yeah…it’s been strange here too. Almost like all four seasons in one month – I was freezing the other day but I thought I’m not putting the central heating on!! Oooh that fence looks really colourful, but those flowers look even nicer especially with the bird motif MOL. 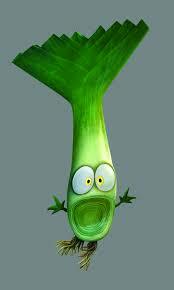 Ooh and your leek looks just like my peep first thing in the morning, 2AM, when I bring a PAL home for supper.! 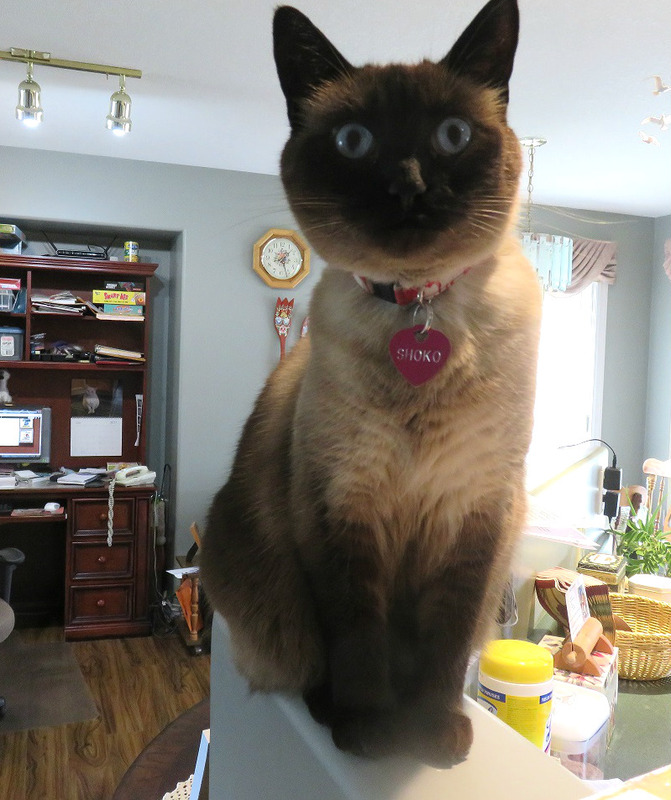 MOL Your peep must be a riot…does he leak all over or just around the kitty litter? MOL Mom doesn’t do anything interesting like that. I never think of the hanging baskets and have never seen a hummer. The fence looks great. It is good that you can share the cost with your neighbor. Sharing the cost was not to the neighbour’s liking when we said it would be $1,000 each. He hummed and hawed for over 2 months and then hubby found out if the cement was put down on an angle so the water ran off from the fence post, the posts didn’t rot anywhere near as quickly. So he examined them and the posts were put in this way. 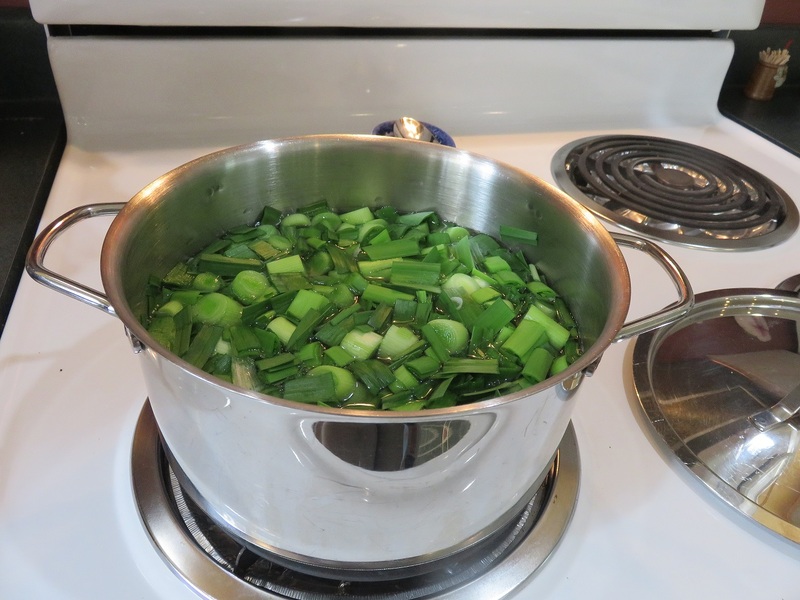 Then the cost for each became $600….the neighbour liked this. 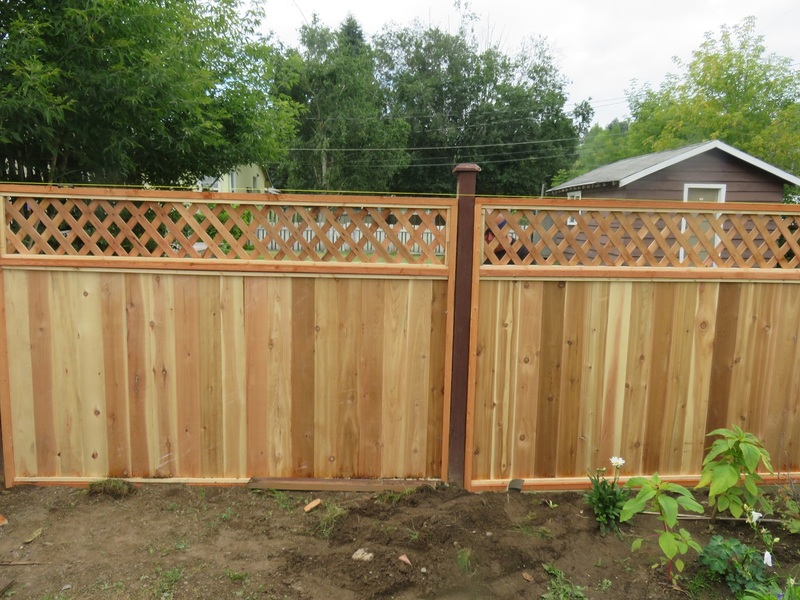 Voila, a new cedar fence. I can understand that $1000 can be difficult for the average person to come up with. $600 is still a lot but it’s way better. Hey ladies! What a grand new fence! 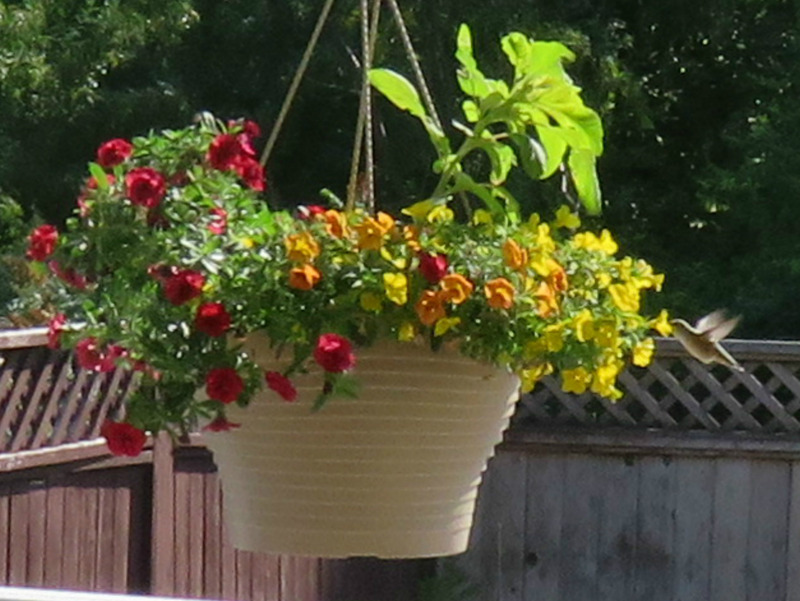 Is that a little hummingbird visiting your Mom’s hanging basket of flowers? They are tiny but I bet they are – er – um – tasty. 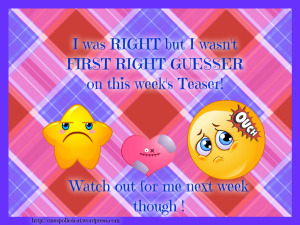 Oooops, did I say that out loud?? Sorry. Anyway, have a serene Sunday girls. I absolutely love the new fence. Fences are good safety for kitties AND doggies. That thing makes me feel very secure for you kids. Lucky the stars of bird TV can fly. They are fast. They fly like stink and by the time I know one is around…..its gone. The new fence is so good, nobody can come in or go out. I love to see photos of you, ladies. Hi Kosmo…good to hear from you. Is it still cold there? Dear ladies, it is raining, again. Hey that’s some smooch in the flowers!!! We love it! happy Sunday to you guys! Hope your Sunday is marvelous dear friends. That’s a beautiful fence… and we love those hanging flowers too. 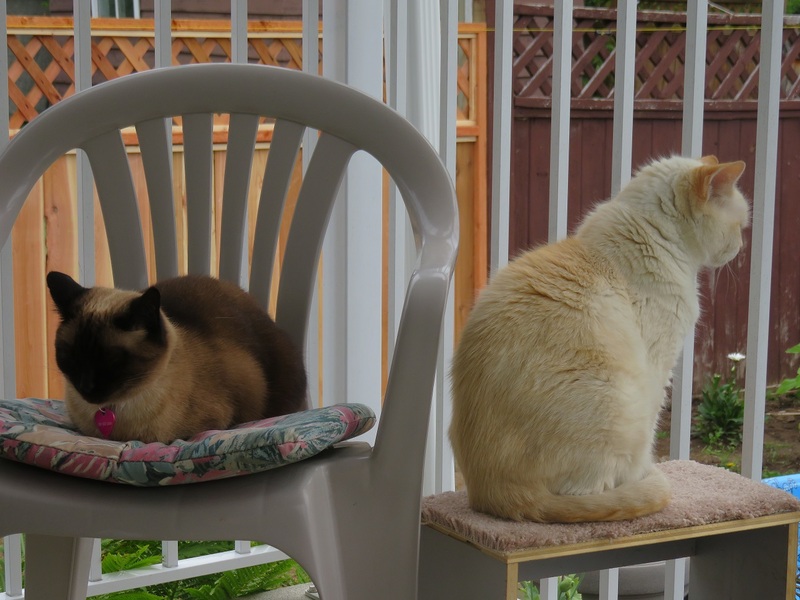 Bugsy, Knuckles and LOu, this fence was in negotiation with the neighbour for months. A settlement meant we’d get a fence this year. woo hoo! Thank you Pixie and Zorro. Would you believe dad worked on it all day and its half finished now. Great selfie! And da fence looks pawsome! Thanks my southern friends. We are delighted with the new fence. What a nice comment everyone. Wish we were closer and could really chatter at length. The neighbours don’t help with anything but the money for the fence. There is a landlord involved and pinning him down was a true test of how much we wanted that fence. Are those Cow Kitty’s pawrents next door? The fence looks like cedar, very pretty. I understand about the smoke because of all the fires we had in this area last summer. I’ve never experienced anything like that before, and hope not to again. Much of it was deliberately set by sicko’s. Anyone with respiratory problems suffered. 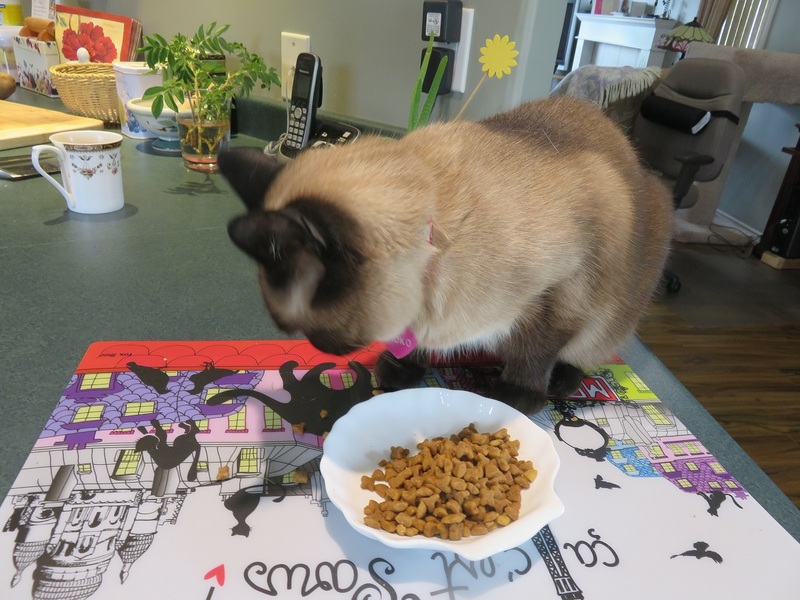 Shoko, you are very special to be able to eat off a French food mat! Cow Kitty lives on the other side of us. The fence is indeed cedar and we plan to use Thompson’s Waterproofing. The smoke is not bad today and hopefully the firefighters are gaining with the fires. Cow Kitty lives on the other side of us. He was able to climb the fence when he was 6 months old. He goes where he pleases. Cow Kitty was in a fight last night. He came over here to mellow out and I patted him. We then went to see Bob Dylan and when I got back, his fur was all in place and he looked well….then he went to his own house. How nice that you all got to go outside today. That little hummer is cute. We have some that come by here…our feeder is right outside the kitchen window and they will fly and stare in the window at us. They can be very rude! Imagine starring at you through the window. We found the syrup attracted ants and mom has a phobia about ants so the hummers have to eat or drink the million bell petunias. We are glad you were able to work out your fencing issues. 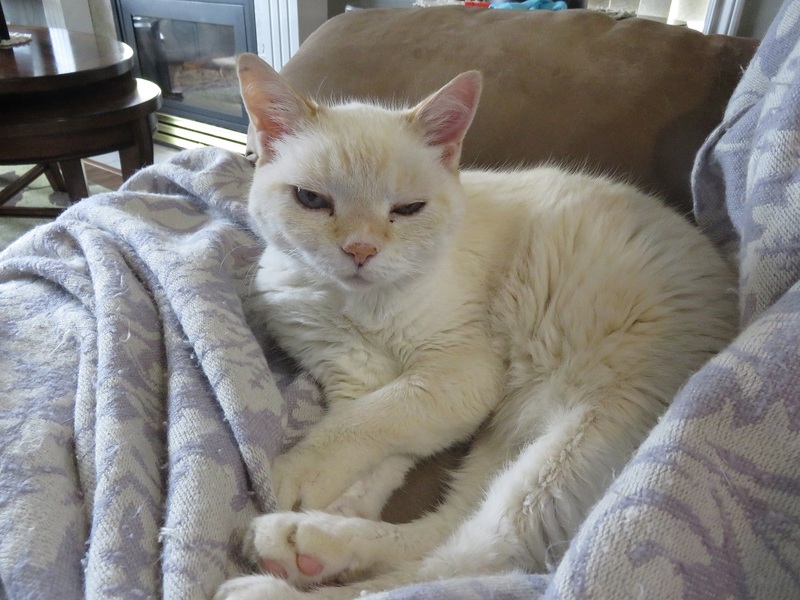 MOL…ya, that was great but it took long enough. At least mom and dad didn’t have to pay for it themselves. 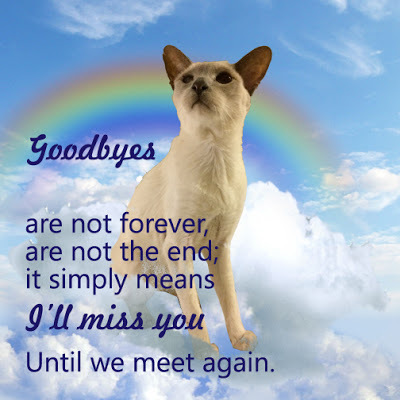 Shoko…we always miss chatting with our friends. Solid lookin new fence there Cuss-innss!!! 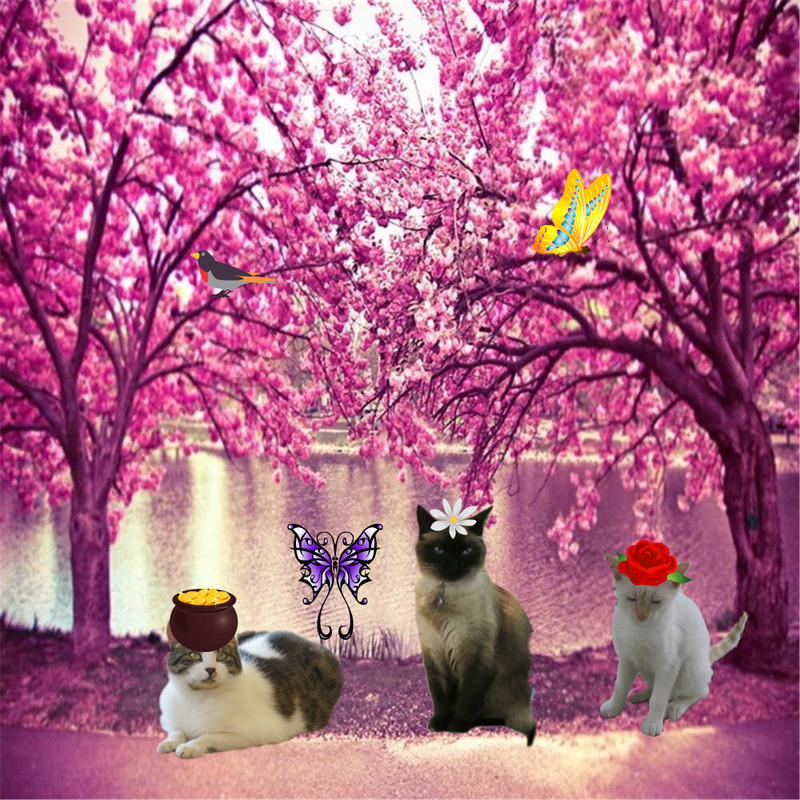 An Shoko you look wonderful an Kali you an mee are tru sleepyheads…mew mew mew…. Yur so purrty Cuss-inn Kali!! Thank goodness we have a new fence. Everybody and their brother was wandering in here and taking a bit of nip. Hopefully they don’t want to jump the fence. Hee likess you an Shoko A lot! 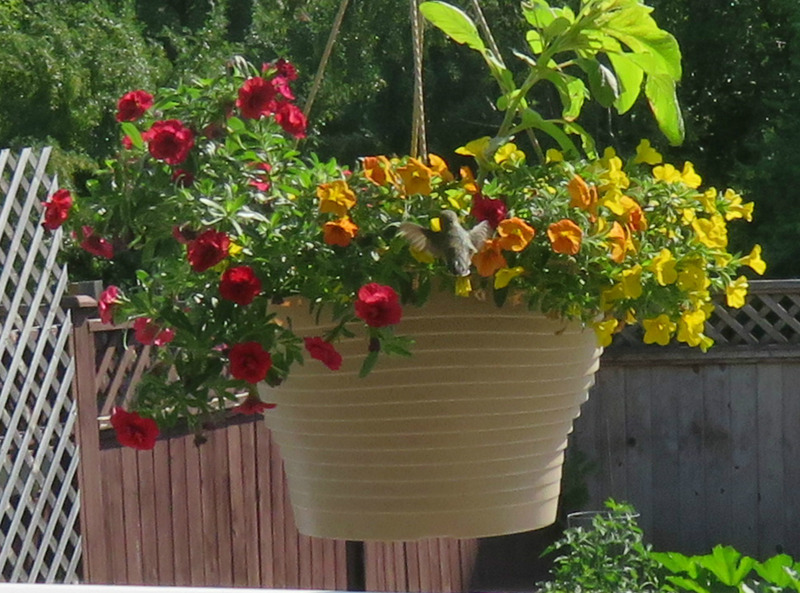 The Hubby swears that he saw a hummingbird in our garden a couple of weeks ago, but I’ve not seen one…wish I could! We don’t do much for the birds in our yard either, because Patty O’Malley and Sweetie may ‘enjoy’ that a little too much. We talk about putting up a fence; The Hubby wants wood and I kind of like the old-fashioned chain linky stuff. When we go out and see old-timey houses with metal fences and gates…now, that’s what I want! Our neighbour wanted a chain link fence because they are cheaper but it wouldn’t match the other 2 fences. I have no idea how chain link fences last but if we had it on the other 2 sides I’d agree. Great news report, Shoko. I think I’m caught up. That old fence looks like the lattice we used to have. Is Cow Kitty gonna be able to visit with the new fence? Cow Kitty was able to get over the fence when he was 6 months old. He lives on the other side of the house anyway. That boy can sure travel…wow. I must say the fence does look rather splendid. I think you and the neighbour must be very pleased with it. Dad is doing an awesome job. So far no swearing or cussin’ so things must be going smoothly. 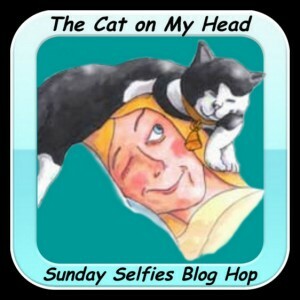 Great selfies, ladies! 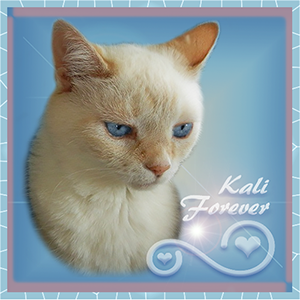 We hope Kali is feeling better. 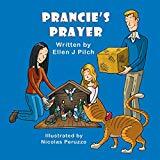 Since Bear is the only one to jump on the kitchen counter, we’ve started using that as an easy way for him to get his wet food treat without feeling stressed by Ellie. Not ideal … but it works! They are funny about the other kitty. Shoko gets jealous every once in awhile and hits Kali’s paw…..yet if Kali has a problem….Shoko comes in and wakes me up to go to Kali. Kali is doing ok…no barf nor runny stool today and she ate like she was stocking up for a marathon so I keep my fingers crossed. Looks like a lot was going on at Fort Meezer. And the fence looks great. Hugs to you, ladies!